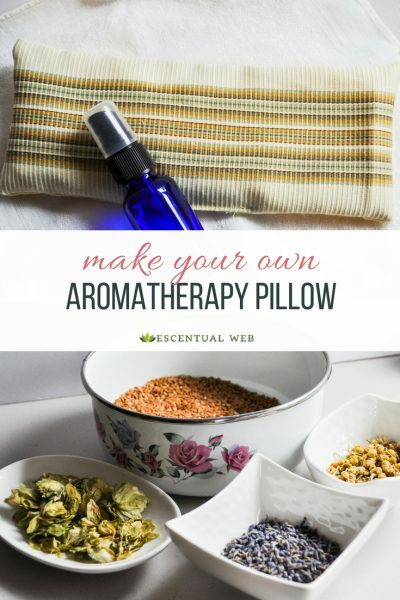 Aromatherapy pillows are a wonderful way to enjoy the scents of essential oils and are so easy to make–even if you can barely sew! If you can cut out a rectangle of fabric and sew in a straight line–you can do this! These cute little pillows are great to have around the house, but they make a wonderful gift as well. Make one for yourself and more for giving. Uses include placing over your eyes/forehead when you have a headache, heating it up and placing over sore or tense spots, or taking it to bed to help you sleep. The finished pillow and spritzer. flaxseed, rice, or buckwheat hulls, about 2.5 cups. Cut out your fabric into a rectangle shape, I cut mine 4.5 x 10 inches but you can make these bigger or smaller. Place the fabric right sides together. If needed, you can use pins to keep the edges lined up evenly. Starting about 2/3 of the way on the long side, begin sewing around all 4 edges, leaving about a 2-3 inch gap on the long side that you started on. Sew about 4/8 inches from the edge. Pivot with your needle in the fabric as you go around the corners. 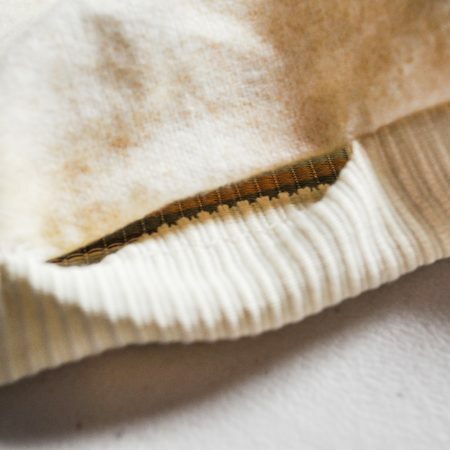 Optional–if your fabric is raveling easily, go around your seams one more time with a zigzag or other finishing stitch. You can finish the seams together, but finish each seam edge on the side with the opening separately (see photo). Trim the seams and clip off the corners close to the stitching. Invert the fabric through the opening. You should now have a pillow that shows the right side of the fabric towards the outside. Use a knitting needle, fingers, or a pencil, if needed, to ensure the corners are completely inverted. 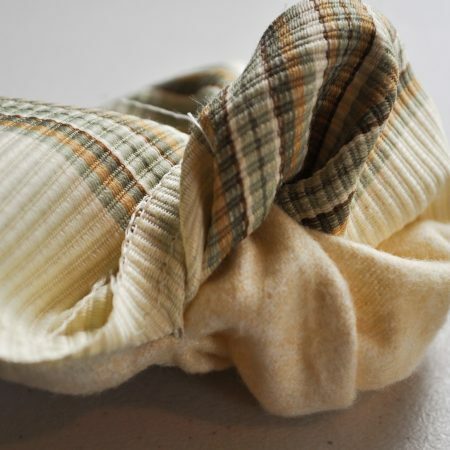 Finish the seams on the side with the opening separately so they will fold neatly into your pillow when turned right side out. Invert the fabric through the opening so your pillow now has the right sides of the fabric facing outwards. A 2-3 inch opening allows for filling. Ensure the seam edges are folded into the pillow. 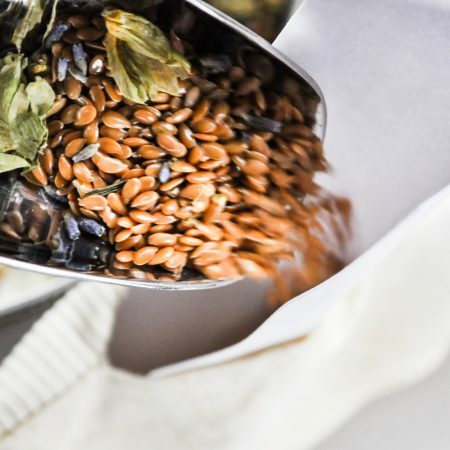 In a bowl (that you won’t use for cooking) combine the flax (or rice or buckwheat) with your herbs. 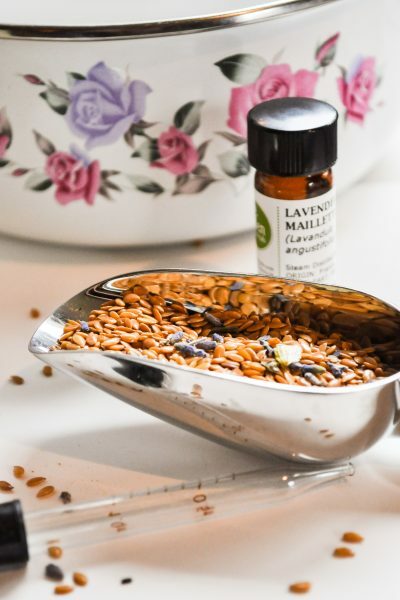 You will need about 2 cups of flax and about 1/2 cup of herbs. The pillow does not have to be filled completely–it should have some flexibility. 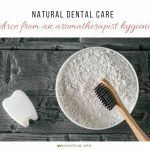 Add about 10 drops of essential oil to your mixture and using a chopstick or spoon (that you won’t use for food), stir it in. 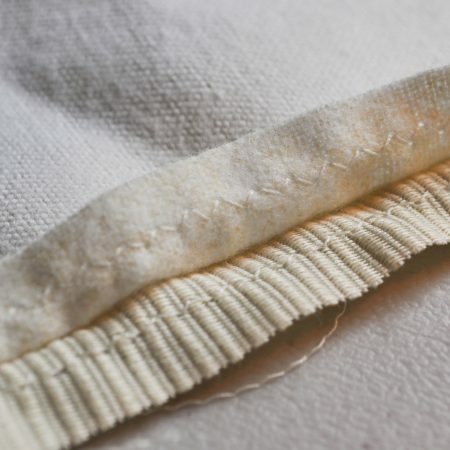 Using your machine or a needle and thread, stitch close the opening, ensuring the seam edges have been folded in. If you are making this to give as a gift later, store in a container or ziploc bag to prevent the oils from evaporating too quickly. 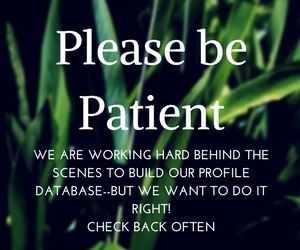 In a 2 oz. glass bottle, place 3 tsp. of high proof vodka or everclear. Add your essential oils (about 36 drops total) to the alcohol. Let it sit for a few minutes so the essential oils dissolve into the alcohol. Top up the bottle with water and place the mister top on. 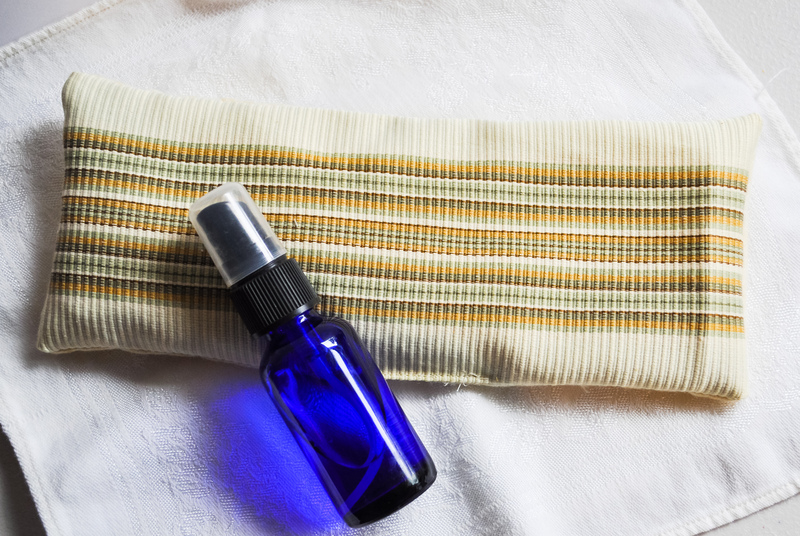 To refresh the pillow, spritz a little of this spray onto it. Safety notes: If you are using the pillow over your eyes or other bare skin, spritz the pillow on the side that won’t contact your skin. If you are heating this, spritz the pillow after it has been heated due to the alcohol content of this spray. When choosing herbs for this project, consider your primary use. For a multipurpose pillow, I recommend lavender. 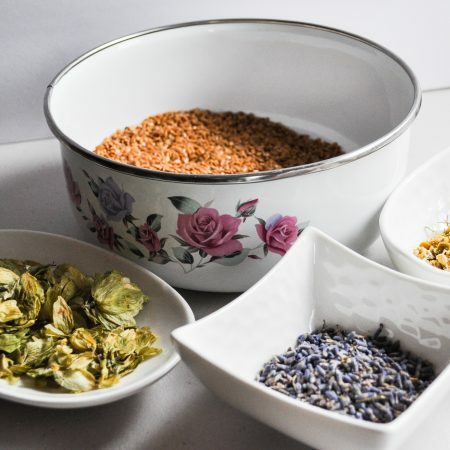 For a sleep pillow, lavender, chamomile and hops are good choices (which is what I used in this project). For a headache pillow, lavender and peppermint would be a good combination. For aches and pains, lavender and peppermint are also good choices. Use about 10 drops of these blends in your pillow. 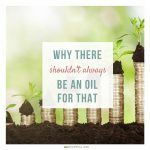 Use 36 drops in a 2 oz. spray.